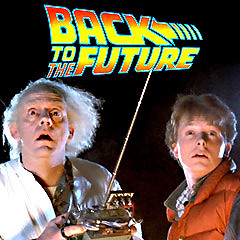 This sequel began where the first film ended, with Marty McFly (Michael J. Fox) and girlfriend Jennifer Parker (now Elisabeth Shue) joining Dr. Emmett "Doc" Brown (Christopher Lloyd) in time-travel ("back to the future") in his DeLorean to October 21, 2015. Jennifer was rendered unconscious with a sleep-inducing alpha rhythm generator so she wouldn't interfere with lots of questions, and so "Doc" and Marty could attend to business in town ("Something's gotta be done about your kids!"). According to Doc, a robbery committed by Marty Sr's own teenaged son Marty Jr. (both Michael J. Fox) was one event that "starts a chain reaction that completely destroys your entire family...That's why we're here today. To prevent this event from ever happening." To avoid having his own son arrested (and serve 15 years in the state penitentiary) for committing a crime of theft (it was shown on the front page of the next day's USA Today - Youth Jailed - Martin McFly Jr Arrested for Theft), Marty pretended to be his own son, Marty, Jr. to stand up to Biff's goading grandson Griff (Thomas F. Wilson) in Cafe 80's. The planned robbery didn't actually occur, but it led to a memorable airborne hoverboard chase scene around the town square, a crash into the front of the courthouse, and the arrest of Griff and his gang of thugs for damage of public property (the USA Today paper headlined: Gang Jailed - Hoverboard Rampage Destroys Courthouse). Marty purchased a copy of Gray's Sports Almanac (that listed the winners of major sporting events between 1950 and 2000), planning to use it for gambling purposes, but "Doc" refused ("I didn't invent the time machine for financial gain") and placed it in the trash. Older (78 year-old) eavesdropping father Biff Tannen (also Wilson) heard about the possibility of acquiring the almanac to use for gambling, and the fact that "Doc" had invented a time machine - and retrieved Marty's discarded copy. While they were involved, Jennifer was found in the alleyway by police, identified as her 47 year-old future self, and brought to her future home in Hilldale. There, she hid in her living room closet as her daughter Marlene McFly (Michael J. Fox) was inviting her grandparents George (Crispin Glover/Jeffrey Weissman) and Lorraine McFly (Lea Thompson) into the house for instant pizza dinner. Jennifer also had a shocking encounter with her own future older self, causing her to faint from the shock at the front door. Biff hired a taxi and followed "Doc's" 'time-machine' DeLorean car to Hilldale where he stole it, and then returned to the year 1955. (Offscreen, he gave his own much younger counterpart a copy.) He then returned to 2015 before Marty and "Doc" realized what had happened. When "Doc" and Marty returned to 1985, they found the entire town of Hill Valley and world had changed for the worse, because the almanac allowed younger Biff after 1955 to "predict" racetrack results (his first big win was in 1958). He became the richest, most corrupt, powerful, sleaziest and "Luckiest Man on Earth". Hill Valley was now crime-ridden (with graffiti, drive-by shootings, biker gangs, homeless, toxic waste reclamation plants, etc.) and known as "Hell Valley", due to Biff's investments and winnings, and the courthouse on the square had been converted into a 27-story casino called "Biff's Pleasure Paradise" for legalized gambling. Marty's widowed, boozing mother was Biff's marital partner (with breast enhancement cosmetic surgery!) after their marriage in 1973, and an abusive Biff was displeased with all of Lorraine's kids, calling them "one big, happy jailbird family." In other developments, Marty's father, a local author, was murdered in 1973 by Biff, and "Doc" had been committed ("Crackpot Inventor Declared Legally Insane"). To restore the original Hill Valley to its better state, "Doc" and Marty had to travel back to the year 1955 to the time of Marty's and "Doc's" previous visit (in the first film) - November 12, 1955 - the date that older Biff gave his younger counterpart the almanac, and prevent the incident from happening. However, the trip was complicated because Marty and "Doc" both had to avoid encountering themselves (with split-screen images) from their first trip back there ("the consequences could be disastrous"). After Marty acquired the almanac by stealing it from Biff during a tense hoverboard-car chase sequence, he was able to succeed in his mission ("the future is back") by burning the almanac (and he also buried Biff under a pile of manure - "Manure. I hate manure"). He was then ready to go back to the restored year of 1985 - it was the same night - November 12, 1955 - that lightning struck the clock tower and sent Marty 'back to the future' in the first film. When attempting to travel back to 1985, the time machine DeLorean car driven by "Doc" was hit by lightning, leaving Marty stranded in 1955. "Doc" was zapped back seventy years to 1885 to the western town of Hill Valley in the past. Standing there alone, Marty received a 70 year-old Western Union message expressly delivered to him from "Doc" at that point in time. It was revealed in the handwritten message that "Doc" had been living for the past 8 months "alive and well" 70 years earlier in the year 1885. For help to get from the year 1955 back to 1985, Marty sought out the "Doc's" 1955 duplicate at the town's clock tower on the town square - this was the momentous night of November 12, 1955. There, he found that the other "Doc" had just sent the other Marty back to the future year of 1985 with a bolt of lightning (the same incident that occurred at the end of the first film). The 1955 Marty told the other "Doc" in the film's final lines: "I'm back - I'm back from the future" - to which "Doc" replied: "Great Scott!" and fainted at the sight of this second Marty. After the box-office success of the first film, the next two sequels were shot back-to-back for release in two consecutive summers. This film was both more somber and dark, and also left the viewer with a 'cliffhanger' ending; however, it had a very complex and sophisticated plot involving time-travel. Computer-controlled camera work, called VistaGlide, allowed three characters (all performed by one actor, Michael J. Fox) to match up and interact seamlessly in the same scene (the "instant pizza" dinner scene), through impressive split-screen photography. With the tagline: "Getting back was only the beginning." Budget at approximately $40 million. Earned about $118 million at the box-office (domestically), and $332 million worldwide. Received only one Oscar nomination, for Best Visual Effects.